Happy Gram - Downton Abbey Has Arrived!!! The Dowager Countess, Lady Mary, Lady Edith and Lady Sybil have graced us with their presence. Their fabric collections have arrived at Happiness Is ... Quilting! today. The Dowager Countess: Bold and elegant, like the Dowager herself, this collection of fabrics is punctuated by prints and paisleys as big as her presence. The gray, purple, and black colors come straight from her wardrobe, and the patterns speak to her undeniable flair, steeped in refined tradition. Lady Mary: A resolute, breathtaking beauty; Mary’s fabrics showcase both her strength and style. Dark burgundy, blue, and green jewel tones saturate her patterns, some of which are inspired by her stunning headdress. Lady Edith: Enterprising and avant-garde both in character and fashion, Edith’s collection features breakthrough colors and patterns from the Edwardian era. Edith’s fabrics suggest the transition towards art deco, as demonstrated by her stylized floral patterns. 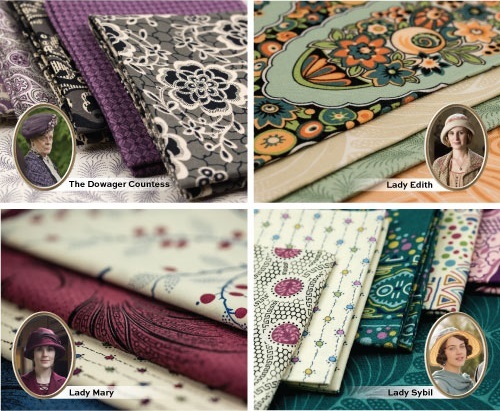 Lady Sybil: Sybil’s fabric collection embodies her kindness, cheer, and dynamic character. The bold geometric and large floral really speak of Sybil. Her colors are a darker seafoam and blue gray with mauve purples, too. 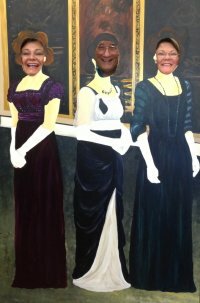 We love our Andover Fabric representative Marty (or should we say Lady Sybil)! For each yard of Downton Abbey fabric you purchase, you'll receive a complementary photo of yourself and friends in our Downton Abbey Photo Stand-In. You can be Lady Edith, Lady Sybil or Lady Mary! We'll print your photo here at the shop. truly represent the style of the Ladies of Downton.